As a coach, author, speaker or consultant, your success is dependent upon having a Signature Program that becomes the profit center of your business and can be leveraged for years to come. Your Signature Program must be designed to empower clients to get the results they want – whether they are working with you personally or not. Without a Signature Program you will be continually reinventing your process, creating new programs that never really hit the mark and worse yet… confuse your audience who can never really understand who you are, what you specialize in or how you can help them. But what if you had the keys to deliver on your promise and impact positive change with every client, whether they were working with you or not? What if your live events, online courses, high end coaching programs and home study programs were so powerfully effective that you became “the leader” in your niche, received endless raving fan referrals and had clients begging to move into your advanced and more expensive programs? This is what’s possible when you enroll in Pathway to Profitable Programs. 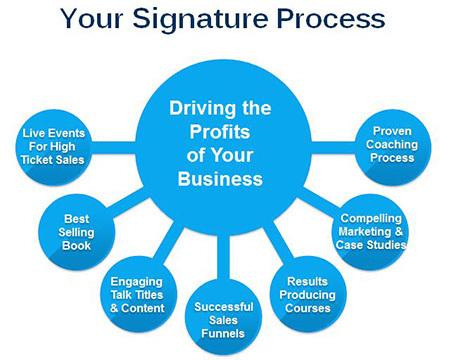 Together, we will walk you through 5 proven steps to creating a powerfully effective Signature Program that delivers on your promise, wow’s clients and becomes the profit engine of your business. Click here to discover Jane’s highly acclaimed course, entitled Pathway to Profitable Programs.